When I first started this book I was excited to learn how to work with the saints in my practice and what that type of practice might entail. While it is still a good book overall, it wasn’t at all what I thought it was when I bought it. 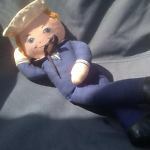 What I thought was a description and the logistics of working with the saints, was actually more of a spell book on what kind of candle working to do for whatever ails you while involving the saints and biblical verses. 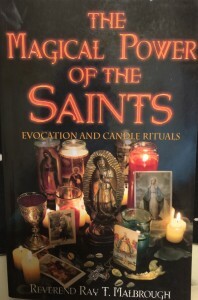 The contents of the book are pretty much in the subtitle of the book, “Evocation and Candle Rituals.” In my opinion, the title should be “Candle Rituals of the Saints.” This would give the reader a better idea of what to expect when they go to read it. The first chapter for anyone starting out has a plethora of information on saints feast days and why you would want to work with them so for the new practitioner this would be a valuable chapter, but not a sole reason to buy the book if you aren’t ready to work with them regularly in your practice. If you are looking for a book on candle rituals incorporating the saints that you already work with, look no further. If you are just starting out and know nothing of working with saints, come back to this book at a later date. Overall this book was a good read so if this subject intrigues you I would recommend it. I will be keeping my copy in hand for when I am more in tune with the saints and am wanting to work with them as it is still a good reference.